Last week, my mind was blown when a woman working for Amazon emailed me with an offer for an ARC of DANCING WITH PARIS, which is one of my favourite author's latest novels. Naturally, I was all up in her grill five minutes after she sent the email and by the end of the day, I was the proud recipent of Juliette Sobanet's fourth novel. And like the previous two I've read (KISSED IN PARIS and SLEEPING WITH PARIS), this one did not disappoint because, just like a flaky croissant, DANCING WITH PARIS has lots of delectable layers and the well-written mystery component acts like a stick of semi-melted chocolate, turning what would usually be an above-average croissant into a pain au chocolat. And there really is nothing better than a pain au chocolat because, as we all know, chocolate makes everything awesome-r.
To start with, DANCING WITH PARIS has a pretty cool premise: Claudia, a thirty-something and recently-pregnant woman travels back to one of her previous lives as Ruby, a twenty-five year old burlesque dancer in 1950s Paris. But that's not all, book clubbers, because not only does Claudia have to figure out the lesson she must learn in order to return back to her life in 2012, but she also has to solve a murder while avoiding being murdered herself. I know, she really does have her work cut out for her. Ha! It's an ambitious plot, to say the least, and Juliette totally nails it. Her trademark descriptions have you can-canning in your seat as you flip through the pages and you can practically smell the butter that radiates out of the boulangeries that line the cobblestoned streets. There were sparkles, short dresses and ample cleavage all over the place and it made me want to stick a feather in my hair and find a piano to crawl seductively across while singing "Fever." Seriously. There are a few cool characters who help Claudia/Ruby along the way and they're all unique in their own right. However, my favourite would have to be Antoine, who has now joined the ranks of my Fictional Hottie lineup. And it's not just because he's French, although that helps (haha) but between his smoky grey eyes and determination to find his sister's killer, I had no choice but sashay on over to my oscillating fan because my body temperature was off-the-charts. Especially after one of the steamier love scenes that are scattered throughout the book. 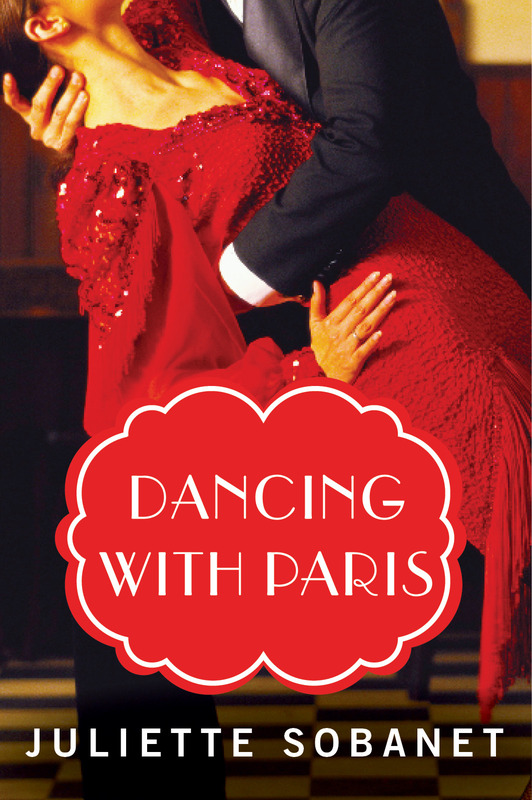 So really, DANCING WITH PARIS may be a more appropriate read for colder months, although don't let the hot flashes deter you from picking it up now. Just, you know, have some ice ready or something. Haha! So, if you like your romance with a side of mystery, are drawn to the Parisian way of life in the 1950s, and love books that make you want to drape a boa across your shoulders and shimmy across a stage, then DANCING WITH PARIS is the book for you! It will be released this upcoming Tuesday, on July 16th, so add it to your Goodreads list and pre-order it, people! And if you'd like to get to know more about how DANCING WITH PARIS came about, Juliette was kind enough to stop by my blog yesterday for an interview, so click here to read it. You'll even get a look at the actor who inspired Antoine (and he's just even better-looking than I imagined). Oh, and if you're a nail-polish fanatic like me, make sure you check out The Nail Files linkup! It's where all the cool kids come to show off their manis and they're totally worth taking a peek at. Who knows, you may just find some inspirNAILtion. Hahaha! I've never even heard of this author before, but I'm definitely intrigued after reading your review. Plus I always love reading French based books, so I'm guessing I may need to look into her books. 1. I'm jealous. I loved her other books. 2. I want a chocolate croissant now. Thanks alot.